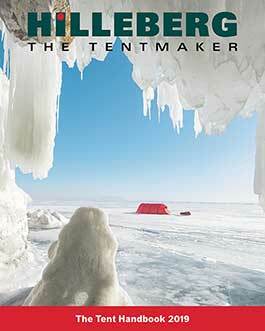 At Hilleberg, “Comfort” is a major performance attribute, because in a tent, comfort is not about luxury. It’s the comprehensive measure of a tent’s overall performance, since it includes everything from keeping you dry when it’s wet and comfortable when it’s warm, to how much room there is to sort gear or move around. We achieve such “comfort” by considering seemingly small things in every aspect of every tent. We favor double wall tents not only because they offer the greatest ventilation and breathability possibilities – and overall comfort – but also because they provide the greater confidence of having two layers of protection between you and the elements. We link the inner and outer tents and put the poles on the outside so that a broken pole is less likely to compromise the tent’s integrity, and so that the tent goes up in one step. That single step pitching means you can get out of the weather quicker, and stay drier longer. It means your inner tent stays dry when you are setting up camp in wet weather. It also means you can quickly put up your tent during, say, a midday break, disconnect the inner tent, and you’ve got a dry, roomy shelter from wind and weather. We make sure that all models are at least big enough for their intended number of occupants and their gear. Our inner tents are designed with as near vertical inner walls as possible to create the maximum usable space and headroom without adding weight, and their doors figure prominently in the tents’ ventilation system (see "Venting for every season, every situation" below). These considerations – and those detailed here on these pages – are only some of some of the details found on our tents. Others include zipper flaps to help protect the zipper; toggle and ring or pole clips for securing rolled away doors in both outer and inner tents; and pockets and either a clothesline or loops for a clothesline in all inner tents. 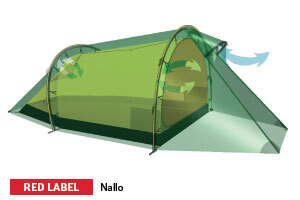 Disconnect the inner and outer tents to use the inner tent alone in warm and dry conditions. Or use the outer tent alone as a group gathering spot in camp or as an impromptu lunch shelter. Photo: Claudia Nägeli & Alexandre Kelle (www.zentralbiker.ch). Allow full and easy access, and can be configured in multiple ways to adapt to changing weather conditions. Photo: Royal Navy Polar Quest. Provide both gear storage and protection for the inner tent door. GT vestibules add even more space for gear (or dogs, as seen here). Photo: Simon Walthert. Offer plenty of space so you can get a good night’s sleep, lounge, or weather storm days in comfort. Photo: Justine Curgenven (www.cackletv.com). In our all season tents, Black and Red Label models, the outer tent goes all the way to the ground, and there is at least one main vent placed high up (two on Black Label models), to allow rising warm, moist air to escape upward even if the tent is pitched in dense grass, or sand, or dug down into snow. The vents are fully adjustable from inside or outside the tent, and the inner tent doors have no-see-um mesh panels covered with zipper-adjustable fabric panels. As a result, Black and Red Label models work well in all seasons. Since our Yellow Label tents are not meant to handle snowy conditions, their outer tents do not go all the way to the ground, thus incorporating ventilation directly into their construction. In addition, large mesh panels, which cannot be covered, encourage, constant air circulation. 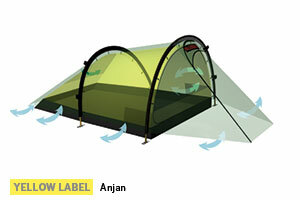 Part of the out tent walls are also designed to roll back and expose the mesh for even more air flow. 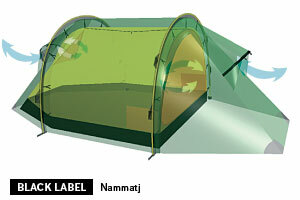 Yellow Label tents function best in warmer and/or snow free conditions.